Recently a friend of mine (I’ll call him Jim – not his name) asked me to teach him how to write computer programs. Since my current favorite language is Ruby, I suggested that he start with one of the Ruby tutorials. We had our first session together a couple of weeks later. Jim had gotten a fair way through the tutorial and knew the basics of Ruby but, I realized, he had no real understanding of what a computer program was about. So I decided that we should write a real computer program. 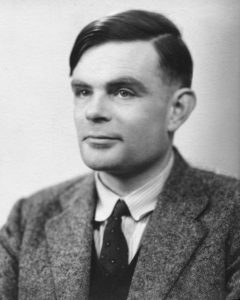 I had recently been reading about Alan Turing and his code breaking efforts in World War II. So I set Jim the problem of building a program to implement a symmetric cypher. A symmetric cypher is one where enciphering plain text produces the cyphered text, and using the same procedure on the cyphered text produces the plain text. I asked Jim to invent a simple symmetric cypher. With some prompting he came up with a cypher which exchanges adjacent letters in the text. Thus “adjacent” becomes “daajectn” which works for text with an even number of letters but fails for an odd number of letters, as we found out with our first attempt at programming it. Jim very much enjoyed this exercise. Rather than concentrating on the syntax of Ruby, we concentrated on what constitutes a computer program and how one goes about designing one. When we needed to know something about Ruby syntax, for example how to read a line from the console, we Googled it. Typically a CPU will be able to obey many different instructions, for example, add two numbers, subtract, multiply, or divide them. Also combine two numbers according to boolean algebra. Also read a number from an input device or write a number to an output device. And test a number and control execution of the program based on the result, for example by going to different parts of the program. Our machine will have an ordinary memory, as large as we like. These are cheap and easy to use these days. It will have a punched paper tape reader for input because these are simple and easy to use, and it will have a paper tape punch for output. The CPU is very simple. It will have seven registers, each capable of holding a number. One of these is the program counter which holds the memory address of the first of 4 numbers making up the current instruction in the program. The next four registers hold the four numbers of the current instruction The other two registers, called register ! and register 2, are used to hold the numbers referred to by the current instruction. Read the current instruction (the four numbers stored in memory starting at the address in the program counter) into the current instruction registers. For the sake of this description, assume the current instruction, symbolized A B C D, is 105 120 114 1012. Read the number from memory location A (location 105) into register 1. Read the number from memory location B (location 120) into register 2. Subtract the number in register 2 from the number in register 1, leaving the result in register 1. Put the result into memory location C (location 114). If the result is less than or equal to zero, put D (1012), not the number in location D, into the program counter. Otherwise add 4 to the program counter (the address of the next instruction). That’s all our CPU has to do! However, this leaves open the question of how numbers are input from the paper tape reader and output to the paper tape punch. To do this our computer will use a technique called memory mapped I/O. We will design the computer so that memory address 1 does not actually use the memory. Instead, a number read from location 1 will be the next number from the input tape. Similarly, a number written to memory address 2 will be punched onto the output tape. With devices as simple as paper tape readers and punches this is not at all difficult to build. Simple as this computer is, it actually would be a practical computer. Given a reasonably large memory, we could write for it a compiler for any modern programming language, and then write and run significant programs. Of course, we probably would want to add more peripheral equipment: keyboard, monitor, external disk, etc, all of which could be built using memory mapped I/O. This entry was posted in Rudd's Blog, Uncategorized and tagged Alan Turing, encryption, Ruby, teaching computing, Turing complete. Bookmark the permalink.